Outings: The PTP Pruning Club meets a minimum of three times a year and at least one time in Spring, Summer, and Fall. We will meet additionally as needed. Training: We’ll provide training on how to prune the trees in the neighborhood as well as instruction on other tree related work that can be done by volunteers. One or more certified arborists will be available to lead. For the most part, training will be provided on the days of the outings but may also be arranged for other times. We may have guest speakers or experts visit the neighborhood to give presentations and training on tree care topics. Water, prune and mulch neighborhood trees. Remove stakes no longer needed, stake trees in need of additional support, and re-stake trees where stakes have fallen or are broken as needed. Trim trees whose branches are obstructing sidewalks and streets. Remove damaged and diseased limbs from street trees. Make trees healthier and stronger by making strategic and proper pruning cuts. Distribute tree care and watering reminder letters to homeowners who received trees through the Philly Tree People approximately one year after receipt of their trees. 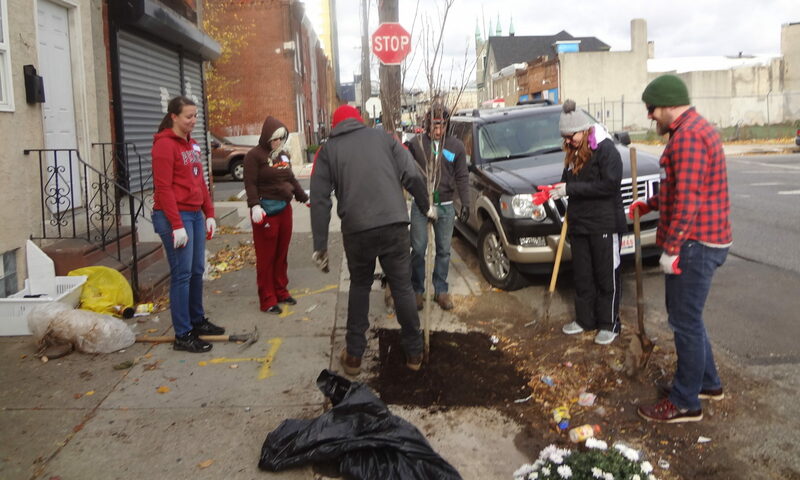 Participate in PTP tree plantings in the neighborhood and others around Philadelphia. Identify and solicit suggestions and requests for blocks in need of pruning for future outings. Participate in other greening projects in the neighborhood as appropriate. Identify potentially hazardous trees, diseased trees, and trees that may need to be removed. Meet neighbors interested in helping to beautify and maintain our urban forest. If you are interested in participating, please contact us at: phillytreepeople@gmail.com or via mail at: 2771 Jasper Street, Philadelphia, PA 19134, or call one of us, so we can inform you of upcoming pruning events as well as other PTP events. Everyone is welcome, whether beginner or experienced. Pruning tools are helpful but not necessary. Refreshments will be provided.